A realistic fire image, featuring exclusive Superior Glowing Ember Crystals. Charred Split Oak log set. A sleek, modern chassis with an arresting bronze-tinted flush panel glass door. To ensure room temperatures stay consistent, the three-setting built-in thermostat cycles the standard 5,000 BTU heater/blower on and off, keeping you warm and comfortable on a chilly day. The ERT3027s standard, plug-in ready, three-pronged 110V grounded power cord makes installation fast and easy. Operation of the fireplace is also made simple with an On/Off switch mounted on the unit. 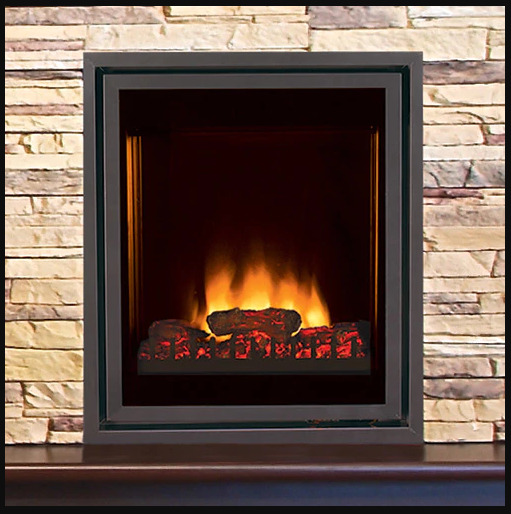 Our Superior ERT3027 Pro Series 27" Electric Fireplace is a great option for the homeowner who wants the appeal of a fireplace but finds having one installed to be too costly, too difficult, or simply impossible. This unit produces up to 5,000 BTUs of heat and features a thermostat with three settings as well as a remote control. All you have to do is plug the unit into a standard 110-volt outlet and you can start enjoying its warmth and beauty. Measuring only 25 inches wide, just over 31 inches high, and a mere 11 inches deep, this unit does not demand a large footprint in your home. Per the manufacturer, this unit can be installed in a bathroom as long as it is not installed "WHERE IT COULD FALL INTO A BATHTUB OR OTHER WATER CONTAINER." Does this include the fireplace surround (mantel) or just the logs? This does not include a mantel or surround. This is strictly the firebox with the logs.